Fort Deposit–Lowndes County Airport in Winter 2012. 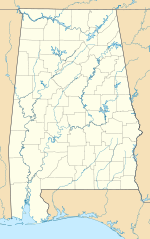 Fort Deposit–Lowndes County Airport covers an area of 55 acres (22 ha) at an elevation of 490 feet (149 m) above mean sea level. It has one runway designated 15/33 with an asphalt surface measuring 3,593 by 78 feet (1,095 x 24 m). For the 12-month period ending August 19, 2010, the airport had 200 general aviation aircraft operations, an average of 16 per month. ^ a b c FAA Airport Master Record for 67A (Form 5010 PDF). Federal Aviation Administration. effective 25 August 2011. This page was last edited on 24 March 2018, at 22:16 (UTC).